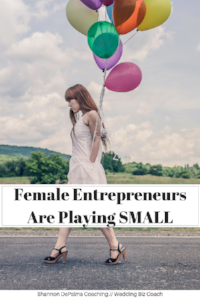 Female entrepreneurs are playing small. Hide behind what we think should come before our own. Hide from judgement of others. We down play our needs, desires, and wants. We stand in fear that if we own our power or truly go after what we want, that we will take away from others or someone or something. We think sacrificing our needs and wants will lead to a better family. But what if playing small actually hurts our families? What if denying yourself of your passion doesn't help your family? By not truly stepping what you want, owning it, and going after it, you are actually denying your family of more. If you desire more, if you desire a successful business, if you desire to be a leader in your industry, then you must go after it. You have to fully own and fully stand in power that it will be YOURS. You have to fully own your power. Own the power that you have to get anything you want. Own the power that your desires match as much as anybody else's. Click on the cover to grab your copy! !